PARIS (Reuters) - France’s main far left party, the hardline CGT trade union and some 80 other organizations on Saturday led several thousand people in street protests across the country against President Emmanuel Macron’s reforms of the public sector. Organizers hoped that the protests would grow further into a groundswell of opposition to Macron’s reform of France’s public service and some state enterprises such as the heavily indebted national railway company SNCF. Union officials and the police gave widely different figures for the turnout. 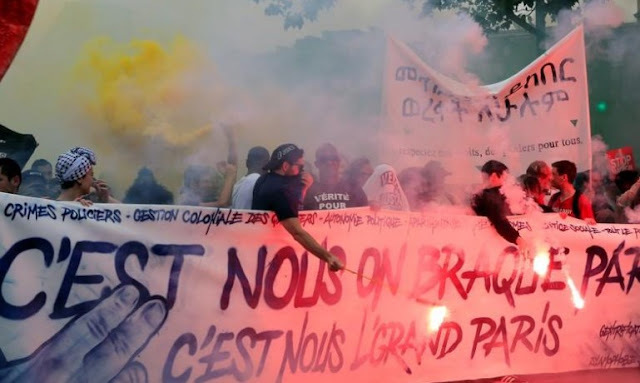 CGT said 80,000 people participated in the protest in Paris, and 250,000 came out nationwide. The police, however, said the protest drew 21,000 in Paris. The turnout was lower than the 320,000 during a previous nationwide protest in March. “We are going to carry a message (and) this message must be heard by the strong-headed Emmanuel Macron,” Jean-Luc Melenchon, leader of the far left France Unbowed party, told a cheering crowd in the southern port city of Marseille. Melenchon listed a number of grievances including staff shortages at hospitals, limited admissions at universities, and lack of police in tough neighborhoods, because the government says it does not have the means to fund them. “We do not believe you because you are lying,” Melenchon said, adding that Macron’s government had given a 4.5 billion euros ($5.25 billion) tax break to the rich which could have been invested in hospitals. “The country is rich. The country must share,” Melenchon said. Protesters are expected to hold rallies in at least 160 places across France, CGT Secretary General Philippe Martinez said, adding that Macron should listen to the growing anger. French Interior Minister Gerard Collomb said that police intervened in Paris after a group of hooded protesters tried to destroy a bank. Seven police officials were injured during the intervention, Collomb told France BFM TV. The police said 35 demonstrators were detained for various offences. Macron, 40, who came to power a year-ago promising to push through tough reforms, has shown no sign of surrender so far. 0 Response to "France's far left leads protests against Macron reforms"